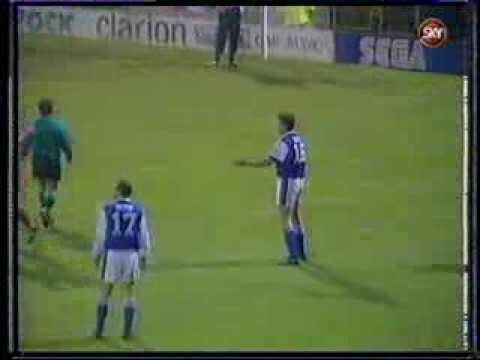 Two-nil up at half time, the Town appear to be coasting to victory - but a double substitution at the break seems to turn things around for Ipswich - David Lowe getting one back within two minutes of the restart, then Mark Brennan equalising just past the hour with a controversial twice taken free-kick. 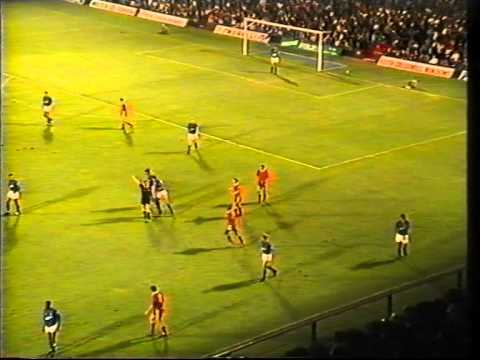 With Macari away in Scotland keeping tabs on a player at Celtic, his team move into a two goal lead against Ipswich - but a goal from Dalian Atkinson, followed by two quick goals in the last two minutes turns the game completely on its head. 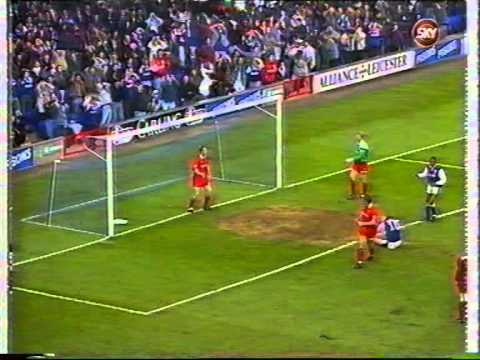 A last minute winner by Steve White completes the comeback - Swindon coming from a goal behind to win at Portman Road. 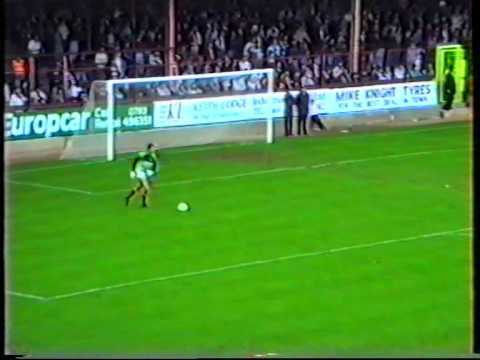 Goals from Duncan Shearer and Alan McLoughlin give the Town a 2-0 half-time lead over Ipswich - the best is saved for the second half though, when Mick Stockwell scores an exquisite 20 yard lob into his own net. 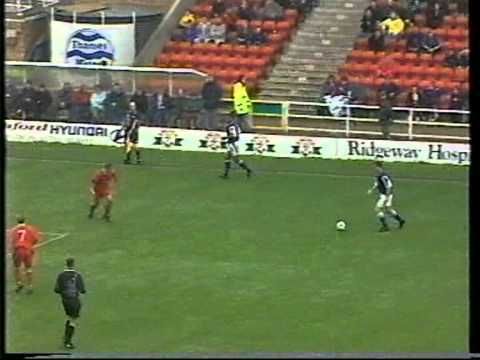 Jason Dozzell's strike with twenty minutes to go, to hand Swindon their second successive defeat, after seven games without one. 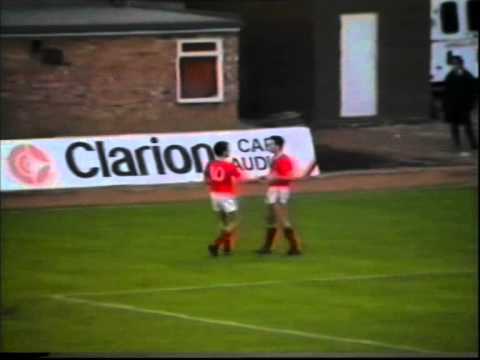 A goal from birthday boy Duncan Shearer thirteen minutes from time gives the Town victory over Ipswich, as Alan McLoughlin is named in the Ireland squad. Ross MacLaren sees his first half penalty saved, before Ipswich net their own spot kick - Duncan Shearer's cool finish twenty minutes from time though saves a point for the Town. 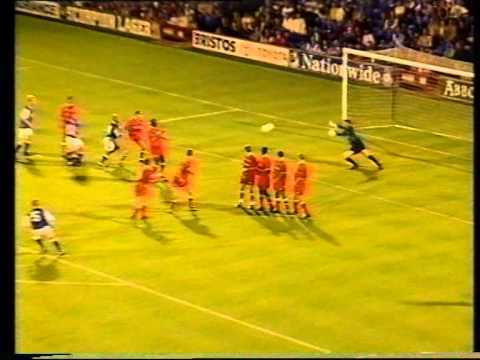 The fans are treated to a Christmas cracker. 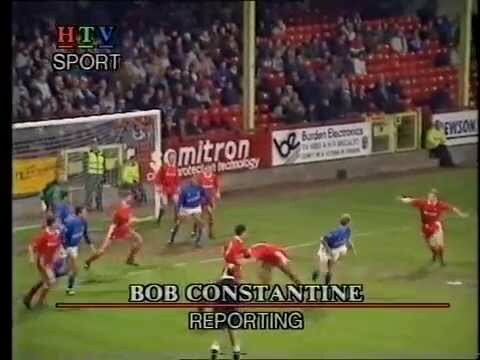 Though John Wark scores twice for Ipswich, Swindon come back from behind on both occasions - the first a d�but goal from Keith Scott on the stroke of half-time, the second a late penalty from Paul Bodin, who converts less than a week after missing a crucial spot kick for Wales that could have taken them to the World Cup. 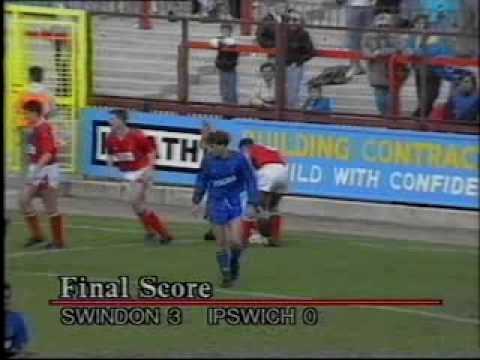 Andy Mutch's equaliser on the stroke of half-time hands Swindon a replay at Portman Road. 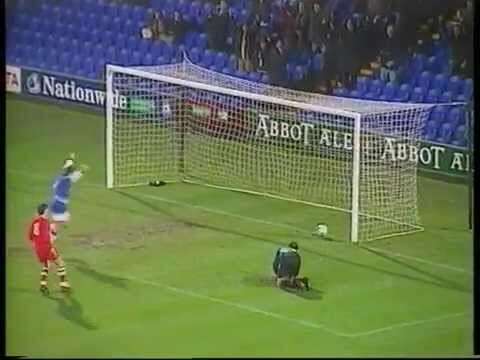 A goalkeeping howler from Nicky Hammond in extra time hands Ipswich victory in this FA Cup replay - but not before Jan Fj�rtoft finally breaks his goalscoring duck for the Town - soon after, an arranged loan back to Norwegian side Lillestr�m is cancelled. 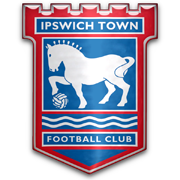 A draw at Ipswich leaves Swindon twelve points from safety with four games to play - but the Town's huge negative goal difference means that relegation is a certainty. 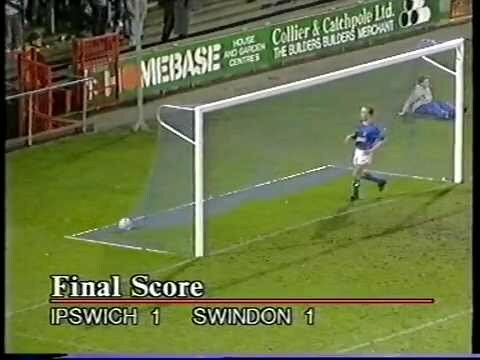 After going ahead thanks to an early goal from James Scowcroft, Ipswich take command in the second half, going three up - and though goals from Thorne and Allison threaten to get Swindon back into the game, they prove to be too little, too late. 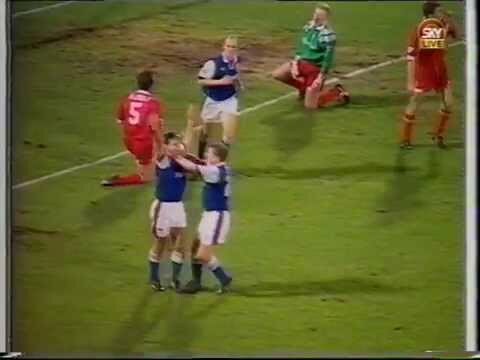 Swindon suffer their first defeat of the new campaign - despite taking the lead through Wayne Allison, Ipswich turn the game around to win 2-1. 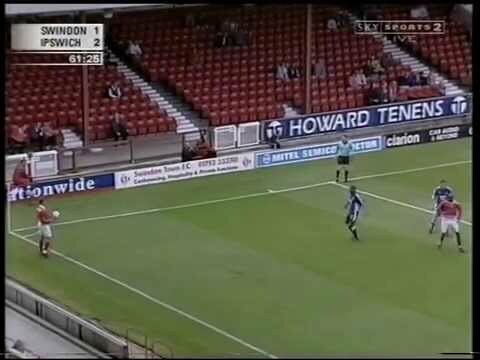 Leroy Rosenior sees improvement in Swindon's defending, despite the single goal defeat at Ipswich. 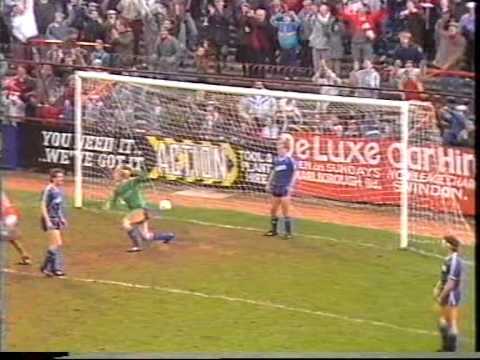 After Craig Taylor's sending off for deliberate handball just six minutes into the game, a shocking defensive performance from Swindon ends with their worst ever home defeat. 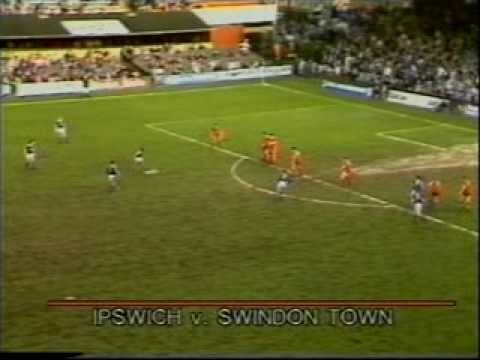 Giuliano Grazioli thumps Swindon into the lead against the run of play - but David Johnson gets Ipswich back on level terms just before the break with a goal on his birthday, and the away side take control of the game in the second half. 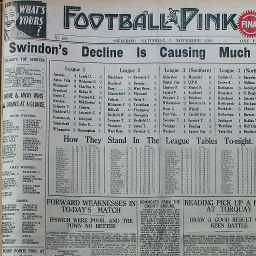 Click to view a newspaper report of Swindon's 1-1 draw against Ipswich Town in the 1938-1939 season. 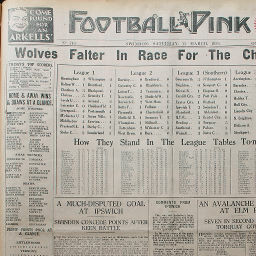 Click to view a newspaper report of Swindon's 1-3 defeat at Ipswich Town in the 1938-1939 season. 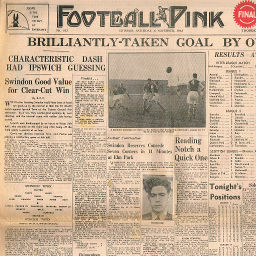 Click to view a newspaper report of Swindon's 1-3 defeat at Ipswich Town in the 1946-1947 season. 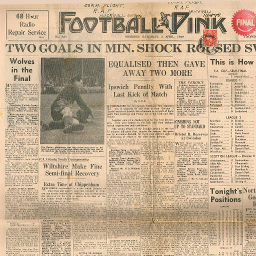 Click to view a newspaper report of Swindon's 2-1 win against Ipswich Town in the 1946-1947 season. 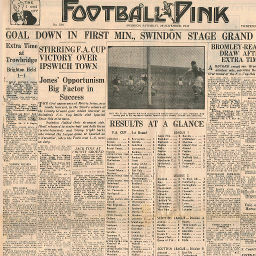 Click to view a newspaper report of Swindon's 1-0 win at Ipswich Town in the 1947-1948 season. 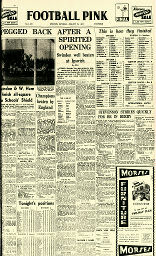 Click to view a newspaper report of Swindon's 4-2 win against Ipswich Town in the 1947-1948 season. 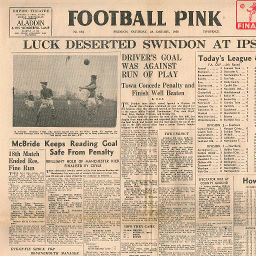 Click to view a newspaper report of Swindon's 0-1 defeat against Ipswich Town in the 1947-1948 season. 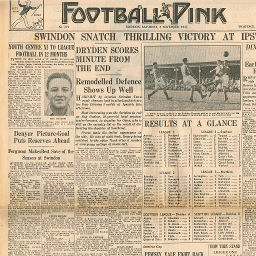 Click to view a newspaper report of Swindon's 4-0 win against Ipswich Town in the 1948-1949 season. 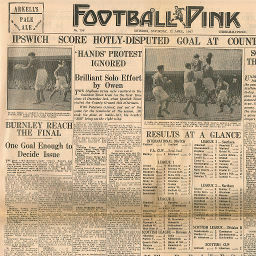 Click to view a newspaper report of Swindon's 2-4 defeat at Ipswich Town in the 1948-1949 season. 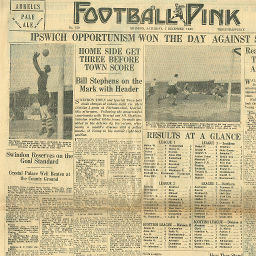 Click to view a newspaper report of Swindon's 1-3 defeat at Ipswich Town in the 1949-1950 season. 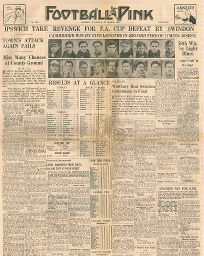 Click to view a newspaper report of Swindon's 0-3 defeat against Ipswich Town in the 1949-1950 season. 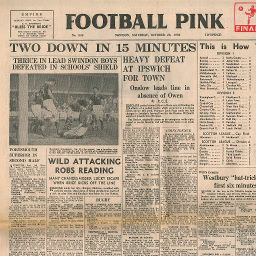 Click to view a newspaper report of Swindon's 1-4 defeat at Ipswich Town in the 1950-1951 season. 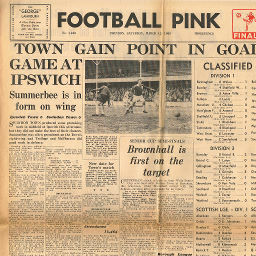 Click to view a newspaper report of Swindon's 5-1 win at Ipswich Town in the 1951-1952 season. 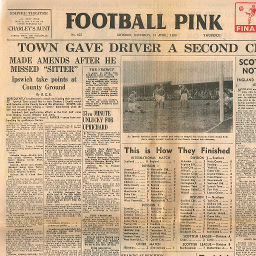 Click to view a newspaper report of Swindon's 1-2 defeat against Ipswich Town in the 1951-1952 season. 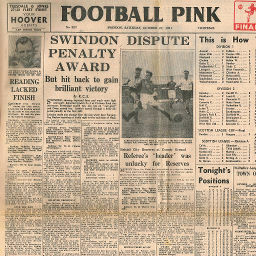 Click to view a newspaper report of Swindon's 2-0 win against Ipswich Town in the 1952-1953 season. 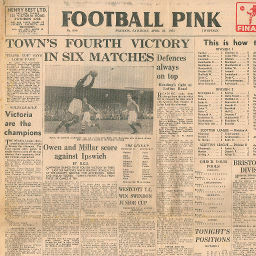 Click to view a newspaper report of Swindon's 1-2 defeat against Ipswich Town in the 1953-1954 season. 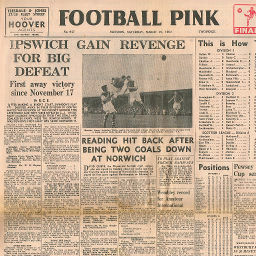 Click to view a newspaper report of Swindon's 0-2 defeat at Ipswich Town in the 1953-1954 season. 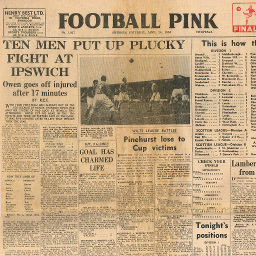 Click to view a newspaper report of Swindon's 2-6 defeat at Ipswich Town in the 1955-1956 season. 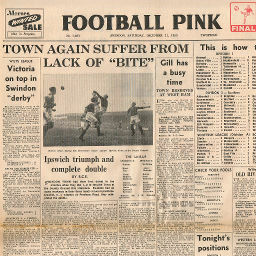 Saturday, December 31, 1955 TOWN AGAIN SUFFER FROM LACK OF "BITE"
Click to view a newspaper report of Swindon's 0-1 defeat against Ipswich Town in the 1955-1956 season. 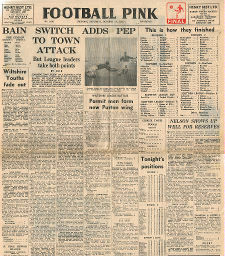 Click to view a newspaper report of Swindon's 1-4 defeat at Ipswich Town in the 1956-1957 season. 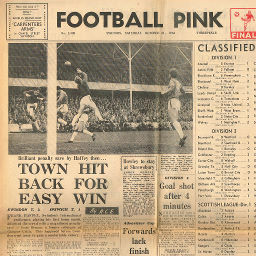 Click to view a newspaper report of Swindon's 3-1 win against Ipswich Town in the 1964-1965 season. 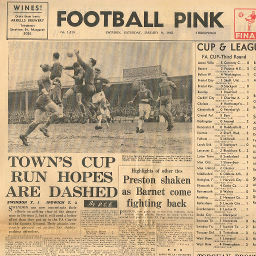 Click to view a newspaper report of Swindon's 1-2 defeat against Ipswich Town in the 1964-1965 season. 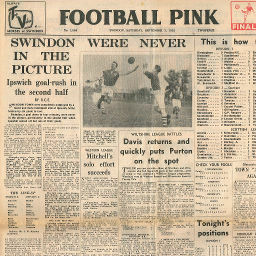 Click to view a newspaper report of Swindon's 0-0 draw at Ipswich Town in the 1964-1965 season. 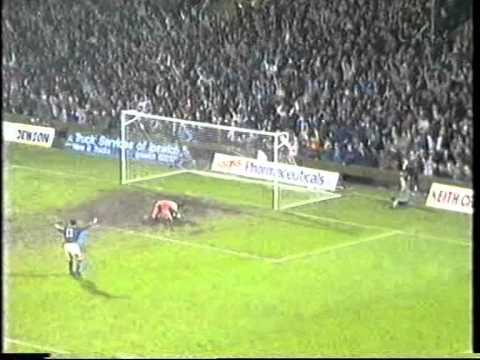 Score at 90 minutes: 1-1.